Firefox Mobile is the browser built for the way you use the Web on your mobile phone. These key design principles are at the heart of the browsing experience: minimize typing, let the Web have center stage, and seamlessly synchronize your desktop and mobile browsing, to name a few. It is built on the same browser engine as Firefox for desktop computers with some extensive under the hood work to optimize for mobile. Secure, powerful and customizable -- Firefox Mobile is packed with your favorite features. · To activate Master Password Support on Android, go to “Preferences” and select the “Use Master Password” check box. · Add Bookmarks to Your Home Screen: Users can now bookmark any website and add it to their Android Home Screen. From the Home Screen, the user can launch the bookmarked website with one click. · There are now over 150 add-ons for Firefox for mobile, and counting. Dozens of add-ons are already compatible with our latest browser version. · We improved startup speed even more (compared to previous Beta versions). This was a top user request. · Scrolling and page rendering are significantly faster and much smoother, showing far less checkerboarding. Smarter page rendering and page loading algorithms led to this very visible improvement. · Reducing memory and optimizing CPU usage are ongoing themes. We have been working on improvements in this area to make the browser more responsive and stable. Overall responsiveness has improved. With this version, we have implemented additional optimizations that speed up the browser and make it much more responsive, especially when using Firefox Sync. · Filling out forms is now easier than ever with our improved Form Assistant: tapping into form fields zooms you in swiftly and shows a list of suggested values to make navigation easy and to minimize typing. This is particularly useful when using Firefox Sync, which helps synchronize form data like user names and passwords (and also bookmarks, browsing history) across your connected devices, so you never have to type a user / password or other form fill data twice. The new controls make it very easy to fill in forms in web pages. · It is now easier to close the sidebars without accidentally reopening them. · We now support copy and paste for all form fields on web pages. · We fixed miscellaneous bugs, introduced usability improvements, and optimized the user experience with this release. Firefox 4 for mobile Release Candidate is also more stable than previous versions. · Japanese is now included in the default set of languages for the Firefox user interface. · Firefox 4 (RC) adds support for IPv6 on Android. · The "overflow: scroll" and "overflow: auto" CSS properties are now supported. · We improved startup speed even more (compared to Beta 3 and Beta 4). This was a top request from Beta 3 users. · Reducing memory and optimizing CPU usage are ongoing themes. We have been working on improvements in this area to make the browser more responsive and stable. Overall responsiveness has improved. 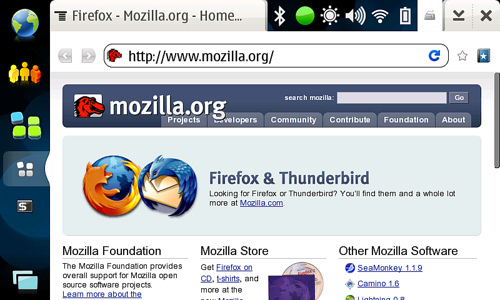 · There are now over 100 add-ons for Firefox for Mobile, and counting. · Startup speed has improved visibly. This was a top request from Beta 3 users. · Memory and CPU usage is reduced, making the browser more responsive and stable. mulala ya ing ginawa ...isipan mu na mo 57.something mb for a mobile phone how can we download that using our mobile phones? andriod 2.3.6 glaxy y duos GT S6102 me install nahi ho raha.